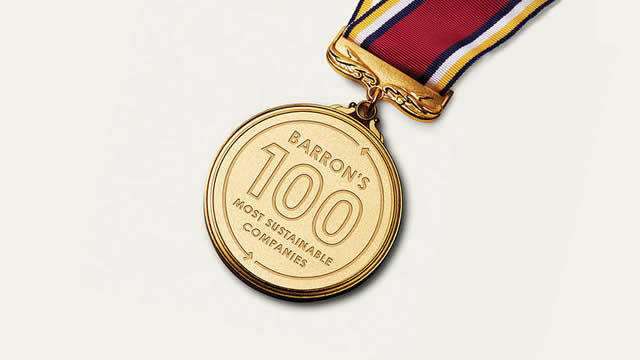 Two TRSA member laundry operators, Cintas and UniFirst corporations, plus two associate members, Ecolab Inc. and VF Corp., recently were named to Barron’s magazine’s list of the “100 Most Sustainable U.S. companies,” according to a Feb. 8 article in that publication. The list – compiled by Calvert Research and Management, a consulting firm – was drawn from the 1,000 largest publicly held companies measured by market capitalization that are incorporated and based in the U.S. Each of the 1,000 companies was rated on its demonstrated responsibility in five key stakeholder categories: shareholders, employees, customers, community and planet. To calculate the ratings, Calvert considered 230 key performance indicators reported by six analytical firms, including Thomson Reuters Asset 4, MSCI and Sustainalytics. The data was organized into 28 distinct areas, ranging from greenhouse gas emissions to workplace safety and diversity in staff/leadership. These, in turn, were sorted in line with the five key stakeholder categories cited above. Each company received a rating of 0-100 in each of these categories, using Calvert’s proprietary analysis and scoring methodology. In addition, to qualify for the list of 100 Most Sustainable Companies, businesses had to rate above the bottom quartile in all financially material stakeholder categories. The top scorer in the overall list was Best Buy, followed by Cisco Systems, Agilent Technologies, HP Inc. and Texas Instruments. Ecolab Inc., Minneapolis, came in 26th on the most-sustainable list, having improved from 29th in 2018. VF Corp., Greensboro, NC, earned the 29th slot on the list, moving up from No. 43 in the 2018 list. UniFirst Corp., Wilmington, MA, was 38th on the list. Neither UniFirst nor Cintas (shown below) appeared on the 2018 list of most sustainable companies. Cintas Corp., Mason, OH, was 87th on the list. Click here to learn more (pay wall restrictions apply).